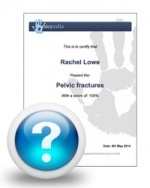 The MPQ may be used for a standard registration and evaluation of the complaints of pain in a patient. Furthermore, it can also be used for diagnostics and to control the effects of therapies and/ or pain relief in individual patients. 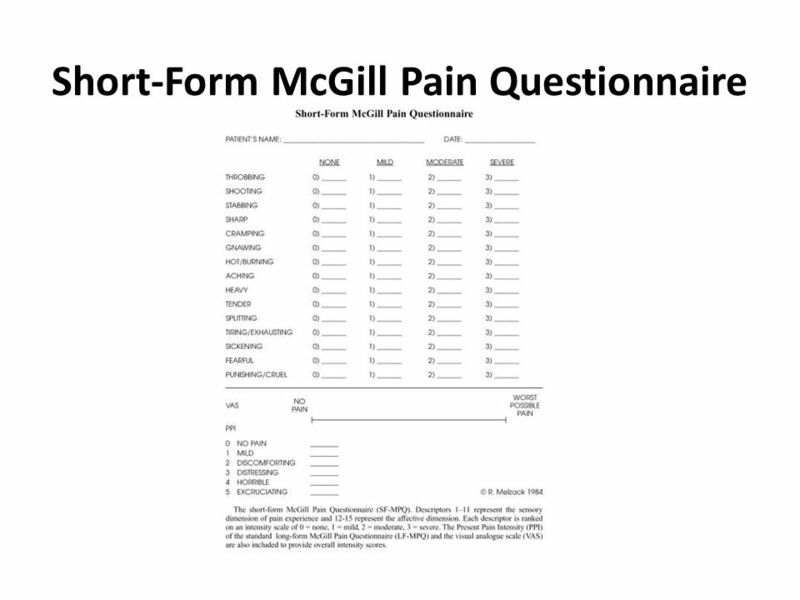 The short-form McGill Pain Questionnaire (SF-MPQ) is a shorter version of the original MPQ, and was developed later in 1987. Affective subscale with 4 words from the original MPQ. These words or items are rated on an intensity scale as 0 = none, 1 = mild, 2 = moderate and 3 = severe. There’s also one item for present pain intensity and one item for a 10 cm visual analogue scale (VAS) for average pain. The SF-MPQ was further revised in 2009 for the use in neuropathic and non-neuropathic pain conditions (SF-MPQ-2). This new version includes 7 additional symptoms related to neuropathic pain, for a total of 22 items with 0-10 numerical response options. The SF-MPQ has been developed for adults with chronic pain, including pain due to rheumatic conditions, but recent research has also proven usefulness of the SF-MPQ-2 in patients with acute low back pain. "Pain Rating Index - rank value": The adjectives are ranked according to increasing intensity so each descriptor can be assigned a higher score. "Pain Rating Index - scale value (VAS)": The pain intensity of each pain descriptor was assessed on a numeric scale in previous research (Melzack and Torgerson in Melzack, 1975). The assigned rating can also be accepted as the score for the pain descriptor. "Number of words chosen (NWC)": The number of words chosen by the patient. The higher the total score on the MPQ, the more the pain experience for the patient increases. When evaluating the test-retest reliability of the SF-MPQ in patients with musculoskeletal pain, the results were adequate (r>70). When examining the same questionnaire in patients with rheumatic pain, the results were significantly higher (r>85). Only the subscale ‘current pain’ demonstrated a lower intraclass correlation coefficient of 0.75. For the internal consistency reliability, a Cronbach’s alpha of r>0.75 has been reported by Melzack et al. It was found that the SF-MPQ has more content validity among patients with fibromyalgia than for those with RA. Percentage of use of 15 pain descriptors in 2 groups was significantly different for all words except “throbbing” and “punishing-cruel.” The mean intensity score for each word ranged from 1.69 for “sickening” to 2.60 for “tender” in the fibromyalgia group and 1.57 for “fearful” to 2.18 for “aching” in the RA group. It this point, one can conclude that the SF-MPQ is a highly valid instrument to evaluate pain in patients with and without neuropathic etiology. The revised version of the SF-MPQ, the SF-MPQ-2, has been validated for use in chronic pain populations. For example, Lovejoy et al demonstrated an excellent reliability and validity for the use of the SF-MPQ-2 in a group of U.S. veteran patients with chronic neuropathic and non-neuropathic pain. Trudeau et al. conclude that the SF-MPQ-2 is a valid instrument to assess pain qualities in patients with acute low back pain. The purpose of the questionnaire is to obtain descriptive values rather than to objectively detect change in time since pain is a subjective concept. Nevertheless, the SF- MPQ has been found to be responsive to change and indicated a clinically valuable difference in a population with musculoskeletal conditions, but the measurement properties vary between groups of patients with pain. For the osteoarthritis population, however, a prospective observational cohort study demonstrated no significant changes over time. The coefficient was calculated as an estimation of the minimum detectable change. Another study showed a comparison of the responsiveness of the VAS and the MPQ. Dworkin et al. amended the SF-MPQ to produce a measure (the SF-MPQ-2) that has excellent reliability and validity and provided support for four readily interpretable subscales—continuous pain, intermittent pain, predominantly neuropathic pain, and effective descriptors.